To arrange complimentary shuttle pick up- please call the hotel when arriving to the airport. The Hilton Houston North hotel offers you superior comfort close to all the action in the *Energy Capital of the World. * Our beautifully renovated North Houston hotel with its awe-inspiring atrium and attentive staff is less than half an hour from thrilling attractions including Minute Maid Park - home of the Houston Astros and the Sam Houston Race Park. Explore the shops at the Woodlands Mall and Greenspoint Mall - both excellent shopping destinations. Kick back and enjoy true southern hospitality in our spacious and well-appointed Hilton. it won*t take long to discover why we rank among the finest Houston hotels. 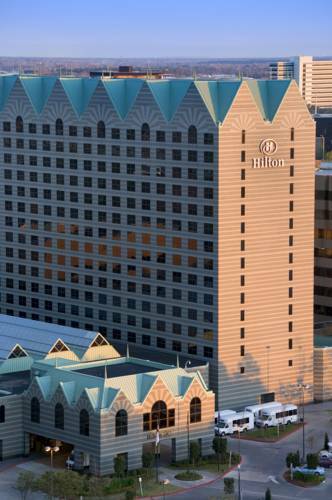 When you stay at the Hilton Houston North hotel in Texas your comfort is our first priority. You*ll be impressed with our attentive and friendly staff and well-appointed guestrooms. Special touches like in-room movies and ergonomic work chairs make it easy for you to relax. Catch some rays beside our sparkling outdoor hotel pool and unwind after a busy day at work or at the malls. Ready to explore. Our hotel is only 30 minutes from downtown Houston and major corporate headquarters such as Exxon Mobil ABS Baker Hughes and FMC. The whole family will enjoy making a splash at Houston*s Splash Town Waterpark. Enjoy world-class golf at Redstone /home of the Shell Houston Open/ or the beautiful Tour 18 recreating famous holes from courses across the country. At the Hilton Houston North hotel in Texas you*ll discover comfort and services that make Houston feel like your own home. RESERVATIONS MUST BE CANCELED AT *4PM* DAY OF ARRIVAL TO AVOID A PENALTY OF ONE NIGHT ROOM AND TAX CHARGE. *NOTE-INDIVIDUAL PLANS MAY HAVE VARYING CANCELLATION POLICIES. Feel like breakfast in bed or a night in relaxing. The Hilton Houston North offers a wide menu selection for almost any time of the day. From eggs and pastries to pasta burgers salads and sandwiches a delectable meal is just a phone call away. Located in the lobby of the hotel. Full-service Starbucks where you can get your favorite Latte and homemade pastries from our Bakery Shop along with a light fare lunch menu.